Weekend Reading: The World from the Mythic Tarot. Looking for a project for the weekend? How about just liking who you are. As you are. In this very moment. You're not so bad, are you? Nah! Take away all the self judgement and self flagellation and, as it turns out, you're pretty cool! In fact, minus all the would'ves and should'ves and could'ves your entire life's not so bad either. 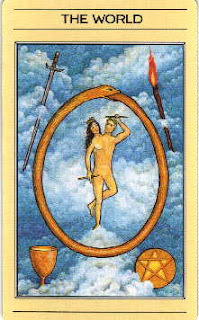 The World card comes to us when we've integrated and accepted opposing parts of ourselves. It also signals a time of successful completion. If that's what the cards say, it must be true. So celebrate the completion of this phase of all that inner that work you've been doing by giving yourself a two-day vacation from self criticism!